I've spoken in both of my blog posts this past week about my affection for Japan. In all my traveling, I've only ever found three places that I liked so well that I would want to live in them without any other temptation than just getting to be in them. These places are New York City (my home "town"), Tokyo and Venice. I've gotten to live in two of these cities - I was a resident in Tokyo for four months in 2007, and I feel in love. Even before that, I was a Japan-o-phile, studied Japanese for 6 years, and majored in East Asian Studies with a focus on Japan. There's no place like Tokyo in the world. I talk a lot about in this post (already linked in my WIP Wednesday, but I know I get some other folks for this post). Since last Friday, every day, I wake up feeling normal, and then at some point in my morning routine I remember that Japan is still in a state of crisis, and I look up the latest updates on the situation with the nuclear plant with a heavy heart, tears in my eyes, a little nausea, and the echoing thought that a place that I love is only 150 miles from such a potential disaster. On Monday, I knew that I wanted to help. I went to the American Red Cross web page, and I donated as much money as I could afford. It felt totally empty. I kept thinking. I decided that if I can possibly manage it, I'm going to use my vacation in September to go and help with the rebuilding efforts that I'm sure will be well under way by then. It felt like too little, too late. I got dressed for the gym...and I had an idea. While I was at the gym, I let it percolate and develop. I ended up skipping out on work to implement that idea, and tonight it will be ready to go. So, without more ado, let me introduce the 1000 Amigurumi Crane Project. The purpose of this project is simple: raise money for aid to Japan. In Japanese culture, cranes are considered to be a sacred animal. There is an ancient myth that promises that anyone who folds a thousand origami cranes, threaded together on a string, will be granted any one wish by a crane. The gift of a string of a thousand cranes is considered to bestow good luck, happiness and prosperity, and strings of cranes are frequently given as gifts to newly weds, newborns, and as part of coming of age activities. 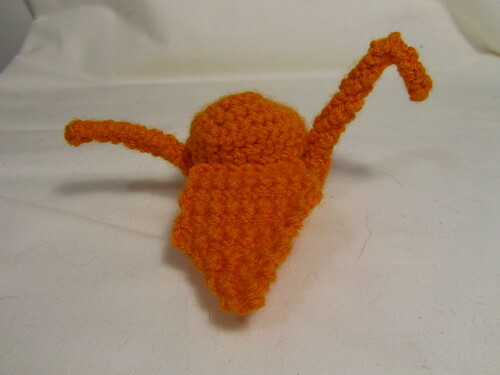 I've designed a pattern for crocheting an amigurumi crane that looks like the origami version of a crane. The basic pattern can be done either in sport-weight (pictured) or worsted weight, and turns out roughly 3 inches high, and 6 x 6 inches width/length. The worsted weight is a little bigger. There are also instructions for resizing the pattern to any other size within reason. 1. The pattern. The pattern is just finishing up testing today. The regular pattern is already confirmed good to go; I'm just awaiting feedback on the resizing instructions. I've made the pattern live on Ravelry while still waiting that final feedback, because I can easily re-send the updated version to purchasers through their system. The pattern is $5. See the end of this post for more details on how the money end of this will work. 2. The finished dolls. I encourage you all to sell your finished dolls to raise additional funds. The regular dolls work up in about an hour - less once you get the hang of it - and are quite cute. My testers were thrilled. :) I've already donated one of my finished dolls (the orange one, pictured above) to a charity auction being done on Live Journal (here, if you're interested). There are several ways to go about donating your doll, such as an auction like the one I'm in, or posting it to a store you've got and donating the proceeds, or requesting a receipt as demonstration of donation and sending it. OR, if you don't want to bother, you can either send your doll to me, and I'll take care of figuring out a way to sell it, or you can join the Ravelry group, and we can match those who have cranes with those who want cranes. I'm selling the small cranes for $10 each, and larger cranes (made with the resizing more) priced accordingly, at roughly $10 an hour as the rate. 4. The community. An effort like this can't work without your help. I'm only one amigurumi crafter, and I'm a small fish in a very big sea. If you think this is a good idea, if you think this is something that can succeed, then please help even just by spreading the word, and encouraging those that you know to spread the word. I'll be distributing information by whatever means I can. I've made a group on Ravelry at The 1000 Amigurumi Crane Project, and over the next few days I'll be sharing it on every forum and group that I can think of - but I'm only one person, with a full time job, leaving for a business trip on Sunday. Even if you can't give - even if you've already given in another form - I know I've heard lots of crafters say in the past seven days that they wish that there was some way we as a community could band together to help. This is my attempt at doing that. I'll also be organizing a crochet-a-long. 1. Buy from me, pay my pay pal account, and when I've built up chunks, I'll pull the money and donate it to the American Red Cross. I'll be keeping updates of the fiscal end of things, including screen caps, in the Ravelry group and the blog for accountability purposes. The downside of this option is that I am not able to cover the percent of your purchase price that gets deducted as fees by Ravelry and/or Paypal and/or Etsy. The upside is that you can then download it immediately from Ravelry, you don't have to worry about anything except sending the money, the rest is up to me. This option will result in approximately 90% of your money going to the American Red Cross. The pattern is now available from Ravelry, and I'm still deciding if I'll put it up on Etsy (etsy has a larger following, but more fees associated with it). You can go directly to buy it here, or you can check out the pattern here if you're a member. 2. Receipts. Show me a receipt (with all personal info blurred out) demonstrating that you have donated the requisite dollar amount to a charity of your choice working for Tsunami Relief, and I will send you the pattern or doll that you've requested. This can be a cell phone bill showing a $10 text donation, a confirmation screen cap from the charity, or whatever else shows that you did it. In this case, I'm trusting you - and I do. I highly recommend the American Red Cross, with the downside being that they require a minimum donation of $10. The Japan Society in New York is also doing a funding drive that appears to accept smaller donations - you can access that here. The downside with this option is you'll have to wait for me to send the pattern for you (I try to have a less than 24 hours turn around on sending out patterns). If you have already donated and want the pattern or a doll, send me proof that you have made a donation of the requisite amount and I will send you the pattern. You can send this information to me at unforth@yahoo.com. If we can sell 1000 amigurumi crane patterns, we can raise more than $4,500 for relief to Japan. If we can sell 1000 amigurumi crane dolls, we could raise an additional $10,000 or more. When I think of all the people that we could help, it brings tears to my eyes. Together, we can do more than any of us could dream of doing alone, and we can help bring joy and happiness and prosperity back to the people in Japan who are suffering. Thanks for your time, everyone. Fiber Arts Friday with Wonder Why Gal. Edit: There are now more posts about the project! Use the 1000 amigurumi cranes tag, and there's an update in this post.